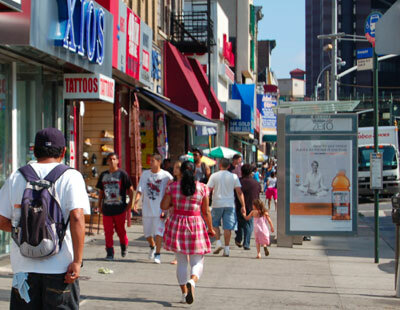 The Graham Avenue Business Improvement District, on Graham Avenue (the Avenue of Puerto Rico) from Broadway to Boerum St. including Moore St., Flushing Avenue, Debevoise St. and all the main streets side streets, is the largest, uniquely affordable, and growing shopping area in Williamsburg. The Graham Avenue BID supports retail growth by encouraging new stores and restaurants to locate here and expand its customer base from the surrounding communities. The BID strives to have the existing and new businesses understand and meet the needs of the BID’s current and changing shopper base. It also works to preserve and share its rich Latino culture with the rest of the city through its celebrated music, art and cuisine.